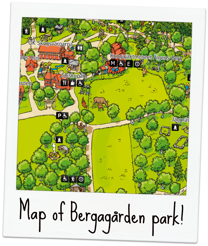 Welcome to Bergagården park on Hunneberg! The area is a very popular destination for recreation and outdoor activities. It also serves as an information center for the mountains. Here you will find The Royal Hunt Museum and restaurant Spiskupan. Halle and Hunne and a very popular destination for both locals and tourists. During the year, several events takes place here, for example theme days, family days and a popular Christmas market.